Just like the attire one wears depends on the occasion, similarly the juicer one needs to buy depends on what one intends to do with it. There is no one ‘perfect’ juicer as fruits and vegetables have vastly different properties. So much so the juicing method adopted for one does not work with the other. Fruits with soft cell walls need gentle extraction while others need to be peeled before juicing. Citrus fruits like oranges and tangerines have bitter outer rinds and grinding the whole fruit would result in a bitter juice. Most of the vegetables have fibrous tough cell walls and require more aggressive mechanical juicing action as compared to fruits. Again it is recommended that vegetable juices should be consumed soon. A juicer is not just a regular investment but an investment in your health. Therefore purchasing a juicer may perhaps be one of the most important health decisions in one’s life. Learn how to select a good juicer. Understand the various features that come with modern fruit juicers. Making your own fresh fruit and vegetable juice everyday right in your own kitchen is the best possible way to alter and improve health and lifestyle patterns. Juicing fresh fruits and vegetables at home is greatly beneficial as it is made sans additives and preservatives. Juicers can be generally classified under three categories depending upon the method of extraction and separation of the juice from the pulp. Masticating juicer: Masticating juicers combine three operations into one. They masticate or chew the pulp and further break down the cell wall structure and then mechanically press or squeeze the pulp to extract the juice. This juicer can juice almost every type of vegetable efficiently including leafy vegetables. Masticating machines operate at lower speeds. Since they chew fibers and break up the cells of vegetables and fruits, the consumer get more fiber, enzymes, vitamins and trace minerals from the juice. Some masticating juicers also make baby foods, sauces, nut butter and sorbets. An optional grain mill attachment is available for grinding grains into flour. It can also make wonderful ice creams like desserts from raw frozen bananas and other fruits. Centrifugal juicer: The centrifugal juicer is the oldest of juicer designs. Centrifugal machines first grind the fruit and vegetables and then push them through the strainer by spinning at very high revolutions per minute. This method is advantageous because it yields more volume of juice. 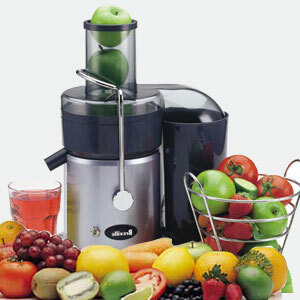 Most of the juicers sold in the market are centrifugal. Optional citrus attachments are available that allow the juicing of citrus fruits without peeling. Centrifugal juicer is not a continuous juicing appliance. These machines use stainless steel baskets and ball bearing induction type motors. Centrifugal Ejection juicers facilitate the basket to be self cleaning so there is not need to stop the juicer and empty it. The pulp is ejected out of the machine and is usually collected in a bin or basket lined with plastic bag to enable discard. Triturating machine turns at slower revolutions per minute. It has a two step process. While the first step crushes the fruits and vegetables, the second step wrings or presses the juice. This process gives the user more fiber, enzymes, vitamins and trace minerals. These juicers homogenize and make pasta and are especially good for people on raw food diets. The oxidation process is slowed down in these juicers as they possess magnetic and bio ceramic technology. Ease of operation and cleaning: Although being easy to clean may sound unimportant, it might have the most influence on your juicing plans. After all when the mood sets in to juice one should just go for it and not be deterred by the laborious cleaning process for a glass of juice. A quality juicer can be cleaned in less than five minutes. Cleaning the parts of the juicer requires little more than a quick rinse under the tap. This makes the juicer easy to keep clean. A quality designed juicer not only cuts the cleaning time in half but also gives flexibility of juicing options. Noise level: A general thumb rule is that the faster the juicer turns the louder the machine is. Based on this fact one can say that Single Auger and Twin Gear Machines are the quietest as they operate at 100 rpm (revolutions per minute). Centrifugal ejection machines that operate at 7200 rpm should be the loudest. Speed of juicing: Inexpensive juicers are centrifugal and spin at high speeds to do their juicing. Some masticating juicers and blenders also operate at high speeds anywhere from 1000 to 24000 rpm. High speed juicers can simply heat up the juice thereby causing damage to some of the perishable nutrients in the fruits and vegetables. A juicer that turns slow at say 80 rpm ensures that nothing is lost through the heated elements of the juice. Such juicers do not have wildly spinning basket or destructive high speed chopping blades. Therefore the heat and impact shock are virtually eliminated and oxidation is significantly reduced. Hence more of the delicate nutrients survive. Length of warranty: While some juicers come with a one or two year warranty, some have five or ten year warranty which is excellent. Power: A juicer machine with a horsepower motor of ¼ horsepower or higher is best suited. Cost: The price of some juicers is too prohibitive and can even go up to $ 2000. In general the price of the juicer depends on its functionality. The average price ranges from $ 250 to $ 350. For fast, easy and quick juice making the centrifugal ejection juicer should be the ideal choice. They will juice most fruits including the skin and vegetables. There are certain juicers in the market like which are specifically designed to produce highest quality juice from vegetables. The juice it produces from vegetables is darker, more concentrated and contains less entrapped air than juice made with centrifugal juicer. Twin gear juicers with fruit attachment will help juice fruits such as hard apples, hard pears, watermelon and citrus. These juicers are mostly recommended for leafy greens and they are not recommended for people who want to juice mostly fruit. While juicing a combo drink, the softest item must be juiced first followed by the harder item and alternate them. This is because the twin gear machine requires fiber to push the pulp through the machine.